I would never have guessed that my silly little comment about quotation marks at the end of yesterday’s post could spark so many witty comebacks. Well, quotation marks be damned! Now that I’m officially *back,* I’ll just have to reach waaaay %back % into my punctuation quiver and pick out a few other sharp marks and symbols. And so, right ++BACK++ at ya! For now, though, I must hold myself >bAcK< and will no longer tap my spinal woes as a source of humor (though the original Spinal Tap, on the other hand, provides its own endless source of punny laughs). And now, let’s get back to today’s Lucky Comestible! If you’ve read my blog for any length of time, you’re likely already familiar with my penchant for breakfast foods. The morning repast is, unequivocally, my favorite meal of the day. So how could I go through five different recipes featuring quinoa and NOT include at least one targeted breafast dish? I’ve already covered a baked good with the Almond-Quinoa Muffins; today, I’ve repurposed Lisa’s amazing Quinoa and Oatmeal Croquettes recipe for a breakfasty-sweet usage rather than the delectable savory meal (smothered in a rich mushroom sauce) that she originally wrote about. Luckily, the recipe is super-easy and employs ingredients I already had on hand, so I was able to whip these up without having to head to the supermarket, which would have undoubtedly strained my finances patience relationship (Oh, just SAY IT:) BACK . I’ve always thought of croquettes as somewhat pear-shaped orbs that sit under a thick slathering of creamy sauce. As a kid, my mom sometimes made chicken croquettes, which involved grinding, mixing, and shaping the mounds of seasoned chicken before rolling them in breadcrumbs and baking them, after which they were doused with à la King sauce (ie, canned cream of mushroom soup) that had a handful of frozen peas thrown in. Representative of the times, but hardly worth the effort, I always thought. When I saw Lisa’s recipe, I was a little surprised at the form of these croquettes. Like that iconic fast-food hamburger, they were square rather than round; and like the proverbial bank heist-without-a-hitch, they were almost too easy: simply cook up, spread in pan, then cut into shape. I suppose I could have used a cookie cutter to approximate a rounded shape, but why bother? Who said croquettes have to be round, anyway? What I like about these little darlings is that the quinoa is very evident–not a co-star, but the main attraction. The oats, while present, don’t really determine much of the overall flavor; rather, they seem to bind the croquettes together instead. The mixture reminded me very much of a polenta in texture and preparation; but the taste was, to my mind, very well suited to breakfast. And so, still limited by the few ingredients I actually had in the house after the GBR, I pulled out some homemade cranberry preserves as a topper and set about heating these in the griddle for breakfast. 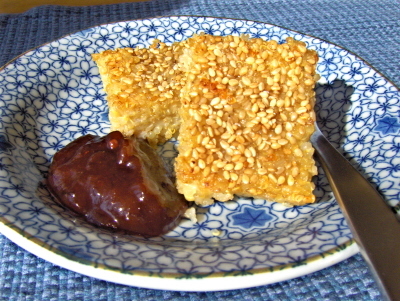 I was very well rewarded with a nubby-textured, moist and chewy croquette highlighted by the occasional crunch, courtesy of sesame seeds sprinkled over top. The slightly sweet, slightly tart jam was the perfect accompaniment. These would also be divine with maple syrup, I think. Oh, and mushroom sauce (as Lisa suggests) too, of course. Quick, hearty, and substantial, these are the perfect breakfast bites. If you’re in a hurry, you can even wrap them up and take them along. And, as Lisa suggests, they make a great base for a savory sauce, too. If desired, rinse the quinoa to remove the bitter outer resin (I didn’t bother, as I assume most quinoa these days is pre-rinsed; but if you want to be safe, go ahead). 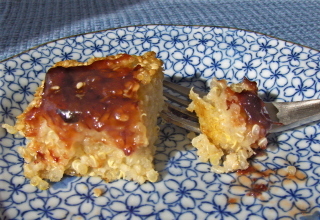 Place quinoa and oats in a glass casserole or pan along with the 3 cups water, cover, and soak overnight in the fridge. The next day, grease a 9 x 9 inch square pan with olive oil or nonstick spray. Pour the mixture into a medium-sized pot and stir in the sea salt. Cook over medium heat, stirring frequently to prevent scorching, until it has the consistency of a thick porridge, about 25-30 minutes. 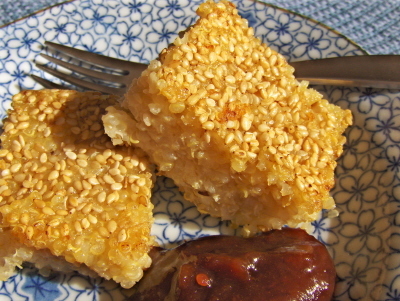 Pour the mixture into the prepared pan, smooth the top, and sprinkle with sesame seeds. Refrigerate at least 20 minutes, to let the mixture cool and firm up (I left it for about 4 hours). Cut the mixture in to cubes of desired size (I cut the contents of the pan into 20 small cubes). Lightly oil a frying pan with the olive oil, and fry the cubes on both sides until golden brown and crispy on the outside. Transfer to a plate and serve with fruit preserves of your choice. Makes 4-5 servings. Will keep for 4 days, covered, in the fridge. I’m so elated that you’re posting again – continue to get well! I’m in love… with this recipe!! I am a quinoa addict, and I MUST try this, MUST!! Great twist on my recipe Ricki. I have never eaten them for breakfast, but now I’m wondering why I haven’t. Glad you enjoyed the Croquettes. Next time you will have to try them with the amazing mushroom sauce. They sound so easy and yet so good…I expected croquettes to have a much more complicated recipe–wow! Cannot wait to try them! I hope that you are taking it easy and not pushing yourself too hard! Another nice little quinoa breakfast snack. Very nice indeed. I live in a quinoa lovin’ household & these sound GOOD! I daresay I’ve never had a croquette, much less one made from quinoa. Sounds like the perfect thing to eat any time of the day! Thank you so much! 🙂 I think these would be great for dinner, as Lisa originally suggested. . .I’m going to try that out next. I had a feeling you might like these ;). They are really easy, and great! It’s definitely worth a try, very substantial and tasty! Thanks again for the inspiration. I really enjoyed them, and can’t wait to try out the savory version! I also thought they’d be more difficult (as my mom’s used to be), but no, they were easy AND good! (And thanks for the concern about the back. I’m taking it VERY easy–only standing for a few hours a day, so no worries!). Well, I guess sometimes simple is best, no? Great to snack on, too, as you suggest. If you’re already a quinoa fan, you’ll love these; the oats are very subtle, and it’s mostly quinoa! This is a perfect way to introduce yourself to croquettes, then. I think you’ll like ’em! those croquettes look really good! Thanks for visiting, and thanks for your comment! Yes, I can tell you that they were, indeed, really good–and easy! Oh, I must make this! I’m confused though… at what point do the oats come into play? Wow i would definitely like to give this recipe a try! Bookmarked, looks awesome, thank you!! I really like these but my 8 mth old son LOVES them!! He has a half to a full square for breakfast with apple sauce or yogurt and a few blueberries thrown in. One morning he had two who squares!!! Time to make another batch. I found they froze well. Also this time I will put the sesame seeds on immediately after I pour in the hot mix. Last time I waited a bit and they didn’t stick on. They are a great base for adding other things such as dried fruit, toasted coconut or cinnamon. Thank you so much! !